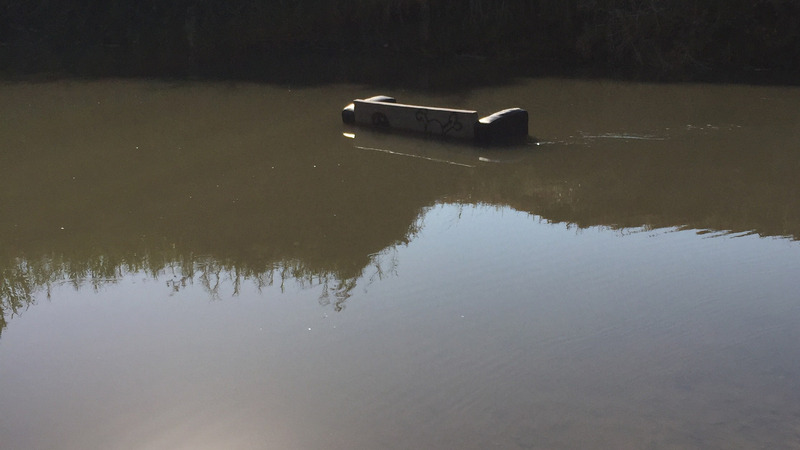 The couch in the Jordan River took me by surprise. No, it was worse than that; I felt insulted. From the moment I’d received my travel itinerary for a Holy Land pilgrimage, I’d had an appointment with God, there on the banks of the Jordan. The renewal of baptismal vows was supposed to be the highlight of the trip. I’d had it on the books for months. For this, I got off the tour bus with my heart all tuned to hear angel-song; I was ready for that white dove to swoop down and say something to me. Our travel guides had made a special point to take us to a more remote section of the river, a place in northern Israel where the Jordan was narrower and quieter. This was presumably to avoid the theme-park atmosphere at popular baptismal sites farther south, where crowds in screen-printed souvenir gowns posed for dripping selfies. There were no crowds at our little section of the river, but no swooping doves either. What we did have: a couch half-submerged in the middle of the water. A skull and crossbones spray painted on its back side peeped above the waterline, a pirate flag where I least expected to find one. And, as with all pirate invasions, my morning was invaded, robbed of sparkly holiness, and re-routed. I noticed for the first time all the trash at my feet, littering the bank. Several yards from the clearing, a makeshift shed sheltered a set of battered plastic chairs. Nearby, some local boys splashed and shouted over Arabic pop music. Also, it was hot. Really hot. The sun stung my scalp and arms like the blast from a salt gun. Assuming God would manage the ambiance, I’d foolishly left my hat on the bus. What I felt at that moment wasn’t anger. It wasn’t cynicism. It wasn’t even disappointment. I had come seven thousand miles for this, I’d cashed out my vacation savings and even dipped into my touch-me-not money, and now God had stood me up. I felt empty. If I hadn’t been part of a group, I might have knelt down in the mud and trash, thinking God needed more supplication or something. But the vow-renewal service started right away. In unison, we read a prayer from a laminated page. One of the priests dipped a bundle of olive branches in the river and flung the droplets out over our heads. Yes, we’ll gather at the river, we sang, that flows by the throne of God. And then we were done. A fellow pilgrim joked under her breath that she hadn’t expected the throne of God to be a soggy couch. Then, with hardly a moment’s pause, we all began filling empty bottles so we could take home some souvenir Jordan-water. The impulse to collect or try to preserve something spiritual — either with or without having really experienced it — was a tendency I observed in myself and others time and again during my trip to the Holy Land. What was I bottling, exactly? Couch-water? I must have been visibly underwhelmed, because as we prepared to leave, my priest sidled up to me. “It’s been there every time I’ve come,” he said, nodding at the couch. “I had a hard time with it too, at first.” And then he walked away, leaving me to wonder at his decision to return here, year after year with groups of pilgrims. What was he trying to teach us? His face shone with mischievous glee. Maybe the emptiness I felt was the point. Maybe, paradoxically, God is present even in God’s absence. Or maybe it’s some other kind of koan, something about finding God where I least expect to, or not finding God because I expect to, or not recognizing God because God’s kicking it on a nasty couch in the middle of the river. More probably, it’s a challenge to my idea of beautiful. But I don’t know yet. All that was less than a week ago, and I’ve touched other relics since then. I’ve traveled seven thousand miles back home and back to work. That couch is still lodged in the center of me, a symbol I don’t understand. I’m trying to laugh about it. But also, even though our meeting didn’t go exactly as planned, God didn’t leave me totally hanging. You see, we weren’t supposed to go in the water that day, but I hadn’t come all that way for a sprinkle. Some people were already on the bus, but I rolled up my pants and waded in. The river moved slow and cool around my knees. It wasn’t blue, but it felt blue, the color of the snowmelt that nourished it. For a half-second I thought I felt God in that coolness, the way the prophet Elijah had heard God in the gentle breeze. Thousands of years ago, on a mountain not far from where I stood, he’d also witnessed the absence of God, in an earthquake and a fire and a raging wind, the same destructive forces in which we still search. “Why are you here?” God had asked him. On the way back to the bus we passed a man standing by the trunk of his car, wearing a t-shirt and the world’s tiniest swim trunks. The man waved his hands at us, grinning crookedly, dancing. He seemed drunk or crazy. But people thought that about the prophets too, and I’m reminded once again that you can’t know what holy looks like ahead of time; God’s the ultimate shape-shifter, a master of disguise. Hi Robert. My use of They/Them as pronouns for the Divine has less to do with the Trinity and more to do with the unsuitability of He or She. To use “He” is to capitulate; to use “She” seems pointedly pagan or maybe just pointed in a way that feels less about God and more about language and politics. To use “They” is actually Biblical, for what it’s worth. Several places in Genesis God self-references in the plural. Plus, I like the non-binary inclusiveness of it. Although that is pointedly political, I hope that in some small way I’m welcoming non-binary folks into the Divine and conversations about the Divine.